Recently, my local YSL counter had a gift-with-purchase promotion. Naturally, I took the opportunity to try a new elite cosmetics brand, especially because I had birthday vouchers I had to use. To qualify for the gift I had to purchase two products. I chose the Teint Radiance foundation and the Touche Eclat concealer/illuminator- I had been lusting after the Touche Eclat for the longest time! Anyway, the lovely consultant helped me select the correct shades (3 in the foundation and 2 in the concealer). I have quite dry skin (can get flaky patches if I let it), so I chose the Teint Radiance as it contains Hyaluronic Acid. Hyaluronic Acid is deeply hydrating and has been dubbed the moisture-molecule for a reason. It helps hold moisture in the skin to the tune of thousands of times its own weight in water. I am so glad this foundation has Hyaluronic Acid in it because I will rarely use a product without it! Although Teint Radiance is hydrating, it is not oily or thick. It is a very light, creamy-textured product that spreads and blends well. It has a satin finish and moderate coverage to give a fresh result. The key feature of Teint Radiance is the mineral particles and reflecting pigments to sculpt the light and shade the face for a flawless and glowing look. It also has an SPF20 to protect from the Sun's rays! A must. I use mine over an illuminating primer for a super-dewy and glowing look (I know it's winter but I'm not all that keen on matte). I dispense two pumps to the back of my hand and work it into my face using a foundation brush and blending from my nose outwards. 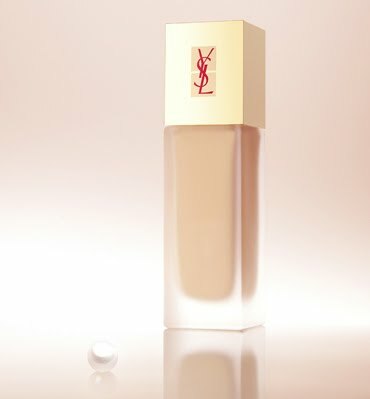 I adore this foundation - I can't say it doesn't look pretty on my dresser with it's gold cap and frosted glass either. The only potential downside for me is the smell. I can't put my finger on it but it smells sort of sunscreen-y. Definitely not a reason to not re-purchase!